Enter to Win a $50 Disney Gift Card! We are gearing up for the biggest shopping weeks of the year (Psst, make sure to check out our post on the BEST Black Friday Disney Deals for 2016 – we will be updating it as the deals roll in!) and we know you are too! Don’t forget to check out all our Disney Gift Guides if you’re still looking for that perfect gift! 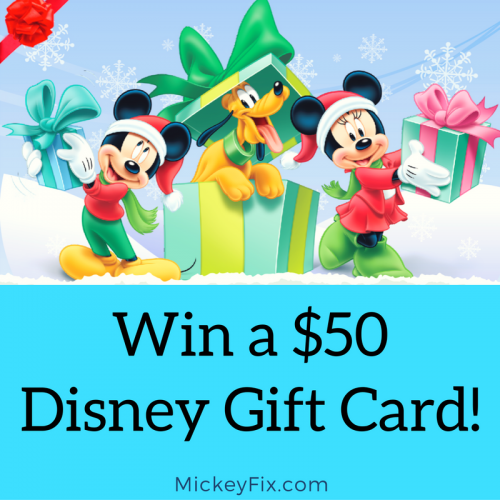 We decided to give away another $50 Disney Gift Card to one lucky Mickey Fixer so they can have a little boost to their holiday budget! Want it to be you? The giveaway will end on November 28th, 2016 at 11:59 pm. The prize will be provided by Mickey Fix. We will confirm that you are a subscriber of the Mickey Fix newsletter. Mickey Fix is not affiliated with the Walt Disney Company or its subsidiaries. United States only. I’m already I subscriber and would like to enter! I subscribed to the newsletter Thanks. I have liked to follow on Facebook. I’m now following on Twitter. Also visited and liked on Facebook. I’m already a newsletter subscriber. I’m already a FB follower. Woohoo! Subscribed to newsletter and already follow on Twitter. I’m a Twitter follower, too. I subscribe to mickey fix newsletter and like on Facebook. I’m a newsletter subscriber and a fb follower and I visited! Thanks and Happy Thanksgiving! I follow Mickey Fix on Facebook. I’m a Mickey Fix subscriber. I follow Mickey Fix on twitter. “Liked” and “followed” on Facebook. I subscribe to the Mickey Fix newlsetter! I follow the Mickey Fix on Twitter! I like and read Mickey Fix on Facebook! Subscribed to the newsletter and visited you on facebook!! I subscribe to the Mickey Fix newsletter! Thanks, it’s awesome! I visited the Mickey Fix page on Facebook and I already have it liked and love it! Thank you! I “like” you guys on Facebook! I subscribe to Mickey Fix. I visited Mickey Fix FB! I’m a subscriber to MickeyFix newsletter. Liked Mickey fix on Facebook too!!! I subscribe to the newsletter, facebook and pinterest pages. I liked Mickey Fix on Facebook! I’ve subscribed to the newsletter! I already receive the Mickey Fix Newsletter, hoping I win! Hope I win! I love Disney! looked at and already follow on facebook!! Visited on Facebook. I already subscribed to newsletter and follow on FB and Twitter. I’m a subscriber to the Mickey Fix Newsletter! Subscribed to the newsletter and follow you on Facebook! I subscribed to the newsletter. Thanks for the opportunity to win the gift card!! I also liked Mickey Fix on Facebook! I subscribe to the MickeyFix newsletter! I’ve been a subscriber for two years! I love this newsletter and follow on Facebook. Need My Mickey Fix!!!! Subscribed to the newsletter and visited you and follow you on Facebook . I follow your page on Facebook! I am subscribed to the Mickey Fix newsletter! I visit your Facebook page often! I have visited MickeyFix on Facebook! New to mickeyfix.com, looks like a great site! I love getting your emails! I love following you on Facebook! I just followed you on twitter! I have subscribed to the Mickey Fix Newsletter! I was already subscribed to the newsletter – love it! Already a subscriber and can’t wait to shop! Love Mickey Fix ! makes me feel like I am always at Disney ! Already subscribed to newsletter and liked on facebook! Would love the gift card! Just signed up! Already subscribed and likedon Facebook. What an awesome gift! I am already a subscriber…. I followed you on twitter. Love finding new Disney friends to stay in the know and plan for adventures! New newsletter subscriber! Just followed on twitter too! Ready for my Disney fix! I have subscribed to Mickey Fix! My Mickeyfix subscription is my only chance because I don’t Facebook or Twitter. I am subscribed to the Mickey Fix Newsletter. I also like Micky fix on Facebook! I’m already a subscriber to your newsletter. I follow looking forward to your posts! I love all things disney! Just signed up for the newsletter. I found this on your facebook page while I was looking through it. I subscribed a while ago! Already Liked you on Facebook too! I follow on twitter (@greentopiaries). I’m a subcriber. Heading to Disney in two weeks. This would be a blessing! Already liked on Facebook as well! This would be right on time for our next adventure. And LIKED you on Facebook! I am a subscriber of Mickey fix newsletter! I’m a long time subscriber to your Mickey Fix Newsletter! I visited your Facebook page! Subscribed, follow on twitter, liked on Facebook and love it ! I’ve been receiving your newsletter for a while. I love it! I got to this page because I already follow MixkeyFix on Twitter!! I already follow you on Facebook. I went to your front page again and love that you post Disney Black Friday deals! I’m a proud new subscriber! I’m signed up for the newsletter & that gift card would be perfect for ordering my attraction poster calendar! I visited on Facebook and follow! And following in twitter-thanks for doing this contest again. I’m subscribed, and waiting for my next great Disney deal! And I like you on Facebook. Have a magical holiday season! Following on twitter and subscribed. I’m a subscriber!! Would love to win! Visited the page and liked the contest post. Already a subscriber to the NL! Thanks for the chance! Already a subscriber and liked on Facebook! I’m subscribed to the newsletter. I subscribed to Mickey Fix! I visited your Facebook page! I love your page and newsletter. I subscribe, follow on FB (That’s how I heard about the gift card), and Twitter. I am a newsletter subscriber and I follow on Facebook. Already a subscriber. Visited Facebook page. Following on Facebook and already subscribed to the news letter. Following on every form of social media! And now on facebook and twitter!! I subscribed to the Mickey newsletter! I already liked on Facebook! I follow MickeyFix on Twitter. I visited on Facebook and saw the picture of the Monorail Cat. I am a subscriber! This will be perfect for our daughters Make a Wish trip coming up. I’ve been a Disney subscriber for a while and love it! Thanks for the chance! Newsletter subscriber and FB follower! Already like your Facebook page! Already follow you on Twitter! I visited your Facebook page.